At CES 2018 Polk Audio introduced its new Polk Command Bar soundbar that features Amazon Alexa voice assistant. Polk Audio says that its Alexa-enabled Command Bar soundbar will be available this spring for $300. The 40-plus year-old audio manufacturer Polk Audio is merging state-of-the-art Amazon Alexa voice assistant technology with a soundbar through the introduction of its new Command Bar. Announced at CES 2018, the new soundbar is one of the first home theater products to combine voice-command technologies and multichannel sound. Designed to serve as the focal point of a modern home A/V system, the Command Bar employs far-field microphones to enable homeowners to control functions such as volume, mute, bass, source selection and the soundbar's surround sound modes all via voice commands. "Intelligent voice services like Amazon Alexa have fundamentally transformed how we interact with our surroundings. However, until now, the home theater was devoid of an elegant solution," boasts Kevin Duffy, CEO and president, Sound United. "For the past year, we worked to develop a soundbar that profoundly changes how we interact with the home entertainment experience. The result is a product that produces Polk Audio-quality sound for movies and music, while simultaneously delivering voice control not yet found in a traditional soundbar." Through its inclusion of Alexa, users can also control other voice-enabled devices in their home, including home control and automation skills such as lighting, HVAC, door locks, and streaming music services like Amazon Music. "Voice is an incredibly natural way to interact with your home, and we're excited to work with Polk Audio to bring customers a new Alexa experience for the home theater," states Dave Limp, senior vice president of devices and services, Amazon. "With the new Polk Command Bar, customers get great sound quality and Alexa voice control for an ever better entertainment experience." Internally the Command Bar employs two 1.25 inch x 1.25 inch full-range drivers, a pair of 1-inch tweeters, and a ported wireless 6.5-inch subwoofer. 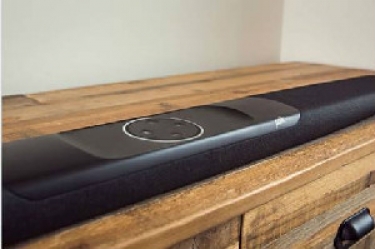 The Command Bar soundbar also features Polk Audio's duck button, which is on the product's remote control to lower playback volume levels so that Alexa hears users' commands more easily. In addition, the Command Soundbar provides a choice of HDMI 2.0b inputs to allow for the integration of technologies such as 4K Ultra HD, Dolby Vision and HDR10 high dynamic range (HDR) content, and HDCP 2.2 compliancy. Polk says more options such as ARC provisions and optical audio inputs also provide integrators with additional setup flexibility to meet a variety of installation demands. The Command Bar will be available in the spring of 2018 for $300.